The host of the 2014 Winter Olympics and Russia’s first Formula 1 race has emerged as a hot favourite to stage the World Championship of Chess. 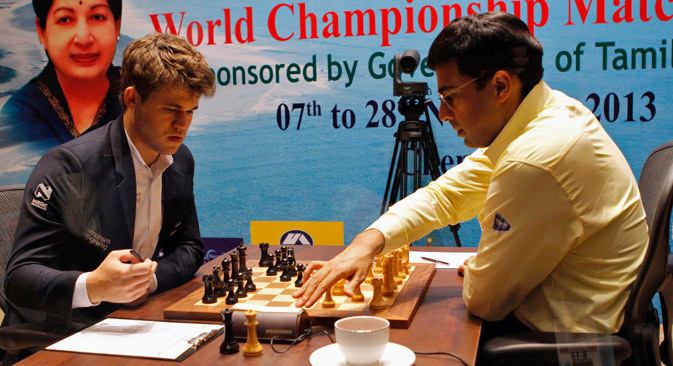 The epic rematch between Indian chess grandmaster Vishwanathan Anand and Norway’s Magnus Carlsen is likely to be held in the Russian city of Sochi. “We do have a firm offer from Sochi and the contract is there, everything is there,” Anand told Indian daily the Bangalore Mirror. These comments come in wake of Garry Kasparov’s comments that there were no sponsors for the contest. Anand dismissed the comments from the Russian chess legend as “last minute campaigning” in a bid to head the World Chess Federation. Incidentally, Kasparov lost the election to compatriot Kirsan Ilyumzhinov. The Indian grandmaster added that he was satisfied with his preparation. “I am quite happy with my training,” he told the paper. “It was tough planning my training schedule with all the uncertainty. But now that things are getting clearer, my training schedule is going quite well,” Anand added that he was happy with his break and would use two up-coming tournaments as preparation. “I would play in Bilbau in September and then will play some Rapids in October. I hope to be ready for the World Championship after playing in Bilbao and Rapids,” he told the paper.